AMSOIL SAE 50 Long-Life Synthetic Transmission Oil is specially formulated to meet the demanding requirements of manual transmissions found in high-torque, heavy-duty line-haul trucks and other commercial applications. Its synthetic base stocks and premium additives help reduce gear and bearing wear, improve shifting and extend transmission life throughout drain intervals of up to 500,000 miles/five years. AMSOIL Long-Life Synthetic Transmission Oil’s high viscosity index translates into better high- and low-temperature performance compared to conventional fluids. In cold weather, it provides easier shifts and reduced fluid drag for increased fuel economy. 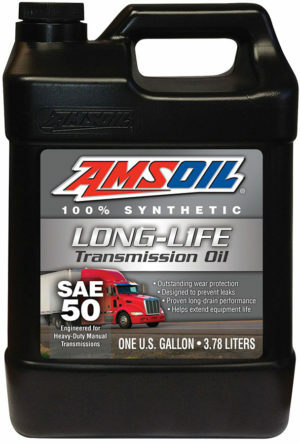 AMSOIL SAE 50 Long-Life Synthetic Transmission Oil is specially formulated to meet the demanding requirements of manual transmissions found in high-torque, heavy-duty line-haul trucks and other commercial applications. Its synthetic base oils and premium additives help reduce wear (see photos), improve shifting and extend transmission life throughout drain intervals of up to 500,000 miles/five years. Compared to conventional fluids, Long-Life Synthetic Transmission Oil can help operators reduce maintenance costs and increase productivity. AMSOIL Long-Life Synthetic Transmission Oil’s synthetic base oils withstand the pressures of high-load, high-torque applications. As a result, it resists viscosity loss due to mechanical shear to provide a durable lubricating fluid film for increased wear resistance and longer transmission life. To prove its effectiveness, AMSOIL installed SAE 50 Long-Life Synthetic Transmission Oil in line-haul trucks and placed them into real-world service. After more than 500,000 miles, a transmission was disassembled and inspected by a calibrated ASTM rater. Results reveal Long-Life Synthetic Transmission Oil provided outstanding wear protection in all critical components (see images). AMSOIL Long-Life Synthetic Transmission Oil’s high viscosity index translates into better high- and low-temperature performance compared to conventional fluids. In cold weather, it provides easier shifts and reduced fluid drag for increased fuel economy. Its exceptional thermal stability inhibits chemical breakdown and sludge formation at high operating temperatures to help transmissions run cleaner. Churning gears introduce air into the fluid, causing foam. When bubbles between gear surfaces collapse, metal-to-metal contact and increased wear result. Long-Life Synthetic Transmission Oil contains foam inhibitors to ensure formation of a strong lubricating film and excellent wear protection. Long-Life Synthetic Transmission Oil is compatible with seals to help prevent leaks and extend seal life. Follow the OEM drain interval for synthetic oil up to 500,000 miles or five years, whichever comes first.